A more cryptic and haunting moniker of trance superstar Armin Van Buuren (alongside his current co-producer, Benno de Goeij of Rank 1), Gaia has always been an effective side-project for the two to develop their trance roots while using the regular "Armin Van Buuren" name to develop and test out new styles of music. In other words, if you miss the trance days of Armin's past, music from the Gaia pseudonym are as close as you'll get to reliving those times. Since the name's revival in 2009 (with Armin having only one song, "4 Elements", under the Gaia name from 2000), Gaia releases one or two tracks per year, often found within Armin's own DJ mix CDs. In 2016, only one Gaia track was released: Inyathi. What IS "Inyathi"? Best I can reckon, it's a village in central Zimbabwe, set up in 1859 initially as a site by the London Missionary Society for reasons unclear to this day. None of that information rings in the song itself, however, for it is simply a trance track with little in the way of African influence. The track generally comes in two forms, the first being the Radio Edit, in which we are immediately jabbed both by the electro-influence vocal saying "Inyathi, Inyathi", followed by the gruff bass stabs soon overlaid by powerful beats and snares. But the heart of the song lies in its trance melody, layered with angelic stuttering and a very straightforward progression that still manages to captivate the ear and the heart alike. For all the songs that are trying to be "totally in your face" in the charts, Inyathi is a welcome change, bringing back an unspeakable emotion while still maintaining strong power. The actual rhythm of the melody itself hearkens back to earlier days of trance, and it's a bit refreshing, if not a bit too simple. The Radio Edit feels as though you're rushing through all the elements, however, without giving the listener much of an opportunity to absorb the audio before it's over — heck, it's not even three minutes long. The Extended Mix takes care of this, offering a longer but still satisfying listen without the feeling of padding. 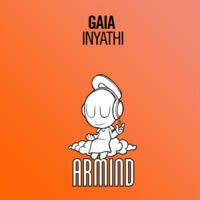 For a strong and memorable trance atmosphere, Gaia's "Inyathi" definitely delivers. Though the structure itself is very simple, the euphoric effect cannot be disputed. Those seeking remnants of trance days past will feel quite at home with Inyathi. It's an underrated Armin hit.